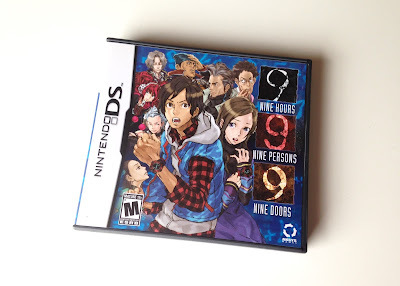 If you read through my most recently published #ADecadeofDS post should be well aware that I mentioned at its close that my next selection for that on-going series would be Chunsoft's 9 Hours, 9 Persons, 9 Doors. Since then, I've put more than nine hours into this horror-tinged visual novel, and I imagine I'll put at least nine more into it before I switch it out for something else. I'm planning to publish another #ADecadeofDS post here in a couple of days, by the way, so if you want to read some of my thoughts on this first entry in the Zero Escape series, keep an eye out for it. In the meantime, I thought it would be nice to ogle some photos of the box art, cartridge label and instruction manual the folks at Aksys Games produced for the North American release of 9 Hours, 9 Persons, 9 Doors. Admittedly, 999's North American cover illustration (see above) isn't quite as stellar as its Japanese counterpart--or at least it isn't in my opinion--but I still think it's pretty great. The North American iteration's cart label simply gets the job done, if you ask me, but I won't hold that against the powers that be at Aksys. 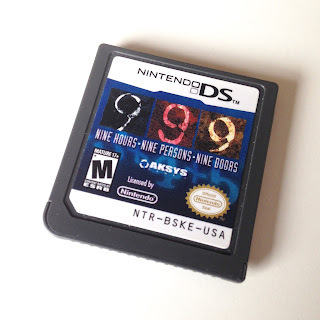 After all, how many DS cart labels can be described as anything but "passable"? 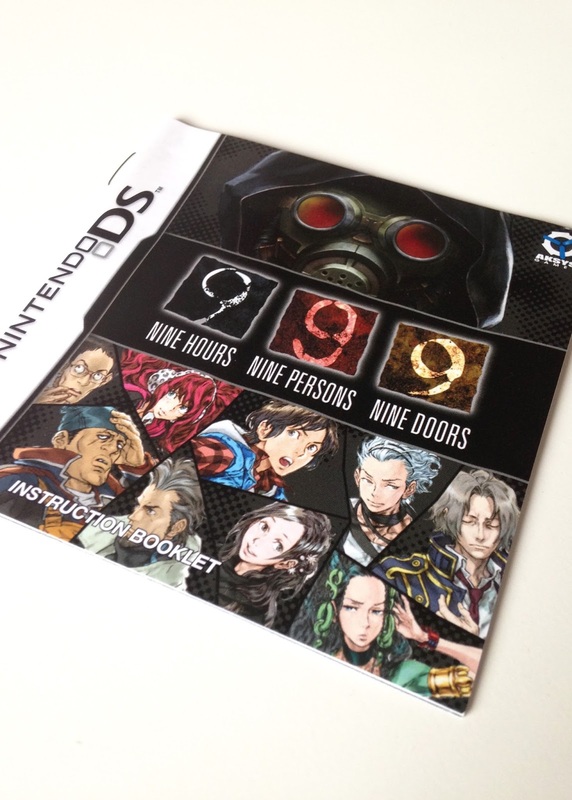 The front cover of 9 Hours, 9 Persons, 9 Doors' instruction manual is more impressive, although even it is far from amazing. I think I'd prefer it if it focused only on the game's colorful cast of kidnappees and ignored "Zero," its antagonist, completely. The illustration featured on the first page of 999's manual goes a long way toward making up for things. Unfortunately, there are only a few other pieces of art in this game's instructional pamphlet--which for me means the overall product qualifies as a bit of a disappointment. Oh, well, at least the cover art that can be seen in the first of this post's handful of snapshots is a looker, right?